I guess I will manage to get a linky party this week. If you have not read my previous post, I had surgery last Thursday and I wasn't sure if I was going to have a post this week. 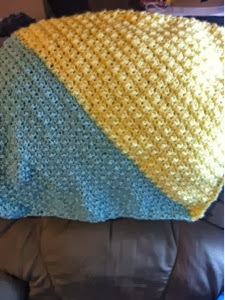 I don't have a food item to share this week, but I did manage to crochet up this quick baby blanket in a day. I was starting to feel a little better as I did not feel up doing of anything the first two days home from the hospital. So now it is time to Show Your Stuff.